Are You the Ultimate March Madness Fan? Enter Your Photo Today! | Hupy and Abraham, S.C.
Are You the Ultimate March Madness Fan? Enter Your Photo Today! Football season is over, and for ultimate sports fans that means it’s time to focus on the next big event: March Madness! Starting mid-March and ending in April, March Madness is a whole month of college basketball championships that inspire bracket challenges and hometown rivalries that throw the basketball-loving community into a collective frenzy. At Hupy and Abraham, we know that sports fans have numerous ways of showing off their team spirit. 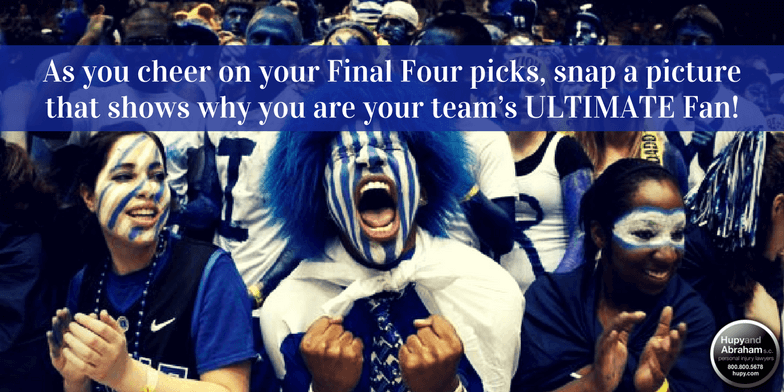 As you cheer on your Final Four picks, why not snap a picture that shows why you are your team’s ULTIMATE Fan? Enter the Hupy and Abraham Ultimate Sports Fan Contest Today! We are looking for photos of you cheering your favorite sports team. Support for any sports teams or organization is allowed! Visit the Hupy and Abraham Facebook Page and click on the "Ultimate Sports Fan Contest" tab to upload and submit your photo. Post your photo with the hashtag #UltimateHupyFan on Instagram or Twitter. Include a caption as to why you are the Ultimate Fan and remember to share your photo with family and friends! Submitted photos will be viewable on the Hupy and Abraham Facebook page in the Contest Gallery, where you’ll be able to vote on each photo, and then the winners of each month will go head-to-head during the final round in April. The final winner will be named Ultimate Sports Fan and will receive an awesome grand prize pack! Don’t wait! Enter your photos now. At Hupy and Abraham, we like to encourage everyone to have fun while being safe. When enjoying the March Madness festivities, please remember to celebrate safely. March Madness fans don’t let other fans drive drunk. If you’ve been injured in an accident caused by a drunk driver, call Hupy and Abraham with your questions at 800-800-5678 or chat with us live.